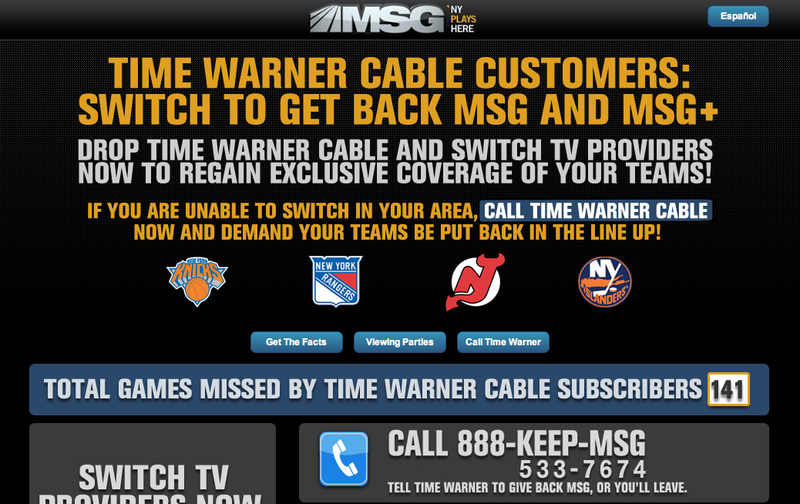 On KeepMSG.com, Time Warner customers got info on how to sign up for other providers to get the MSG Network and local sports programming. We can't, though, easily live without high-speed Internet service, and for that we are forced to rely on our cable TV company." “You can cut the cable, dad,” my teenage daughter has told me more than once when I’ve grumbled about the poor service, unexplained fees and large percentage increases I’ve had to pay over our introductory “triple-play” rates to our cable company. We did suspend our cable service for weeks a couple of summers ago when we were away much of the time. But now the service is back on, despite the charges, cable box freeze-ups, service interruptions and too-frequent slowdowns in our Internet. 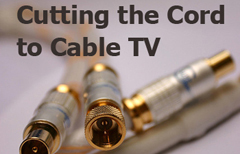 It’s not that we couldn’t live without cable TV. We could, in ways I’ll explain. We can’t, though, easily live without high-speed Internet service, and for that we are forced to rely on our cable TV company, even though we live in the middle of Manhattan, the commercial capital of an advanced, supposedly free-market economy. The whole rigamarole was brought home to me by the recently resolved spat between my provider, Time Warner Cable, and Cablevision, a competing cable company that owns local sports teams and shows them on MSG (as in Madison Square Garden) cable channels. 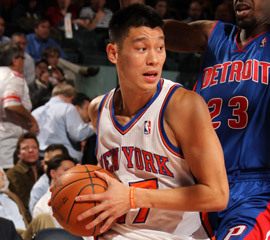 Jeremy Lin has sparked ‘Linsanity’ but Time Warner Cable subscribers couldn’t watch his games on MSG due to a dispute. Photo courtesy of the New York Knicks. TWC stopped carrying MSG, claiming exorbitant fee demands. MSG, meanwhile, offered a page (www.keepmsg.com) where people could get info on how to switch to other TV providers to get their fevered fill of the Knicks’ Jeremy Lin. I thought I now had a guide to a new provider, but so far I’ve struck out. The three recommended competitors aren’t available at my address. I have yet to find anyone else who offers the Internet at speeds we want. As I said, this isn’t just about TV. We do watch enough that switching would be a hassle, but not impossible. The main reason for cable or satellite TV these days seems to be sports. But is watching them live worth $500, even $1,000, per year? Some college football games are available via the web, or at least an animated GameTracker app. I can get tennis matches on paid websites. Many baseball and football playoffs are broadcast. Other sports are more difficult. NBA.TV blacks out local basketball games. Services that claim to offer sports off satellite feeds have enough sketchy reviews that I’m hesitant to risk my computers or credit cards. I could use a remote proxy server and make a service think I’m outside New York, but it’s a hassle and can be a flaky connection. The best option seems to be a somewhat reliable and possibly pirated .de service recommended by local venture capitalist Fred Wilson, who used a #screwcable hashtag to ask on Twitter for options to watch the Knicks. Other programming is less of a quandary. One of our children loves shows on cable networks about animals or cooking, but they’re available via iTunes and other services that would be cheaper to buy than the newly raised rates of my cable TV service. Watching HBO or Showtime shows on rented, borrowed or purchased DVDs. As I said, there are a lot of ways to get programming, but you often still need an Internet or cable connection to watch what, when and where you want, and may — as with some iPad apps or web services such as ESPN3.com — need a log-on from an Internet or cable TV service. Please don’t take this as a screed against any one provider, but rather at the lack of choice and crappy service, in general. You can easily find angry missives against all of my region’s major providers, including Comcast and Cablevision. I know cable companies spent a lot on infrastructure and can appreciate a restrictive business model. Yet, they’ve had decades to recoup the investment that justified their original monopolies. Consumers have options now, and change will come. 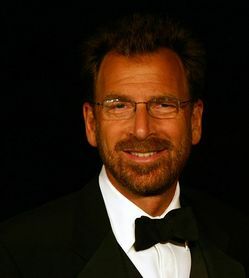 Edgar Bronfman. Photo by Christopher Peterson, Sacredhands and used here with Creative Commons license. Then again, maybe I should consider myself fortunate to have service at all. Compare this to other countries like South Korea, France and Australia, where a higher percentage of the population has broadband access, and often — as in France and Sweden — at much higher average speeds. In the meantime, could someone in my great city please run some cable, couplings, dishes or whatever else is needed to get more high-speed Internet, and maybe TV, to my building? I think the competition would do us good. An award-winning former managing editor at ABCNews.com and an MBA (with honors), Dorian Benkoil handles marketing and sales strategies for MediaShift, and is the business columnist for the site. He is SVP at Teeming Media, a strategic media consultancy focused on attracting, engaging, and activating communities through digital media. He tweets at @dbenk and you can Circle him on Google+.